Poor participant recruitment is the number one reason why clinical trials fail. As such, poor recruitment has consequences across the entire healthcare ecosystem. Every time a trial fails due to poor recruitment, millions of dollars are lost, medical breakthroughs are delayed, and patients miss out on the opportunity to benefit from the latest potentially lifesaving medical innovations. The causes of poor recruitment are multifaceted, but research has identified poor recruitment practices to be at the core of the problem. For this reason, the Clinical Trials Transformation Initiative (CTTI) recently published a best practices white paper that defines actionable recommendations that every clinical trial team should follow in order to improve participant recruitment. At Ripple Science, our recruitment approach aligns perfectly with the CTTI recommendations. In fact, if you read our article, you will see a strong synergy between the Ripple approach and CTTI best practices. In this article, we present our suggestions on how any team (even those not using Ripple) can implement the CTTI recommendations. 1. Identify all stakeholders and partners. In the Ripple SaaS tool, we call this participant and source identification. This is the first step that all research teams should take in the process of developing a recruitment campaign. Participant identification goes beyond simply identifying the inclusion and exclusion criteria of the study. This instead involves thinking deeply about the “participant persona”. Who are your ideal participants? What do they do for work and fun? What are their interests? The ultimate goal of this step is to create your ideal participant persona that can guide you in the identification of sources and sites where you can locate them (see recommendation 2). Of course, identifying these sources is just the start, the next step involves identifying all possible sites within these sources and developing the necessary relationships with site partners. 2. Identify participant locations based on where participants may seek treatment and relevant information. We call this Site Identification. Here we use a broad definition of Site that is different than how clinical research organizations think about them. By sites, we mean all specific sites or locations within the sources identified in step 1 that could be a source of participants and thus a target for our outreach efforts. We recommend teams identify sites within each of their sources discovered in step 1. For example, within the source “Pediatricians” the team should identify each pediatrician within a predetermined distance from the clinical trial site and gather all necessary contact information. Many teams may manage this process in a generic spreadsheet software. However, Ripple simplifies the management of Sources and Sites via a dedicated Sources and Site Dashboard. Here, our users can organize all sources and sites in a single place and track all of their outreach efforts to these sites. The Sources and Site Dashboard includes a Site profile card that helps teams track all information for this particular site including contact names and numbers, outreach materials (letters, pamphlets, etc..), and all internal communication via a Site-specific comments channel. Ripple also allows you to create tasks and assign them to study team members directly from the site. The tasks will be associated with the site, but will also show up on the team member global task management dashboard. The message of a recruitment campaign is critical. An effective message has to accomplish 3 main goals: 1. Catch the intended target’s attention, 2. Clearly articulate the benefits to the target (i.e., “value proposition”), and 3. Make the next steps easy to follow. This applies to both the message included in all marketing materials targeting potential participants and the message included in all outreach materials targeting the identified sites and other stakeholders. Are you between 12 and 18 and suffering from asthma? Testing different messages is also equally important. For proper testing, teams need to have a way to reliably track the performance of each test. One common and effective method is to do a time-limited AB test. For example, within a 4 week period, you can run Message A for 2 weeks and then Message B for the following two weeks, and then compare outcomes. In the case of testing outreach to potential clinics or other sites, the test can be a frequency based AB test. In this case, a team could test Message A to the first 20 clinics contacted and Message B to the next 20 clinics. Ripple helps our users track messages across the entire life cycle of the recruitment period. Our analytics not only provide information about which message led to the most potential leads but also about which message led to the most enrollments, the most completions, the earliest terminations, etc. This level of analytic granularity can provide you with very critical information about what works and what does not in your recruitment campaign. 4. Develop creative material and select appropriate channels for delivery. At Ripple Science, we call these channels strategies. We recommend teams think broadly about the multiple types of strategies that they can use to target the specific sources and sites previously identified. The more the strategy can be tailored to the specific site, the higher the likelihood that the strategy will be successful. For this reason, Ripple allows users to link strategies with specific sites. Investing strategically in recruitment can result in significant savings on overall study costs. Clinical trials and translational studies can cost tens or hundreds of thousands of dollars per month. Investing in recruitment can reduce the length of the study, or prevent the study from extending unnecessarily, which means a significant return on investment. When considering making an investment in recruitment, consider how the cost compares to having to run the study for another 6 weeks or 6 months. In most cases, the upfront investment pays off in the long run. 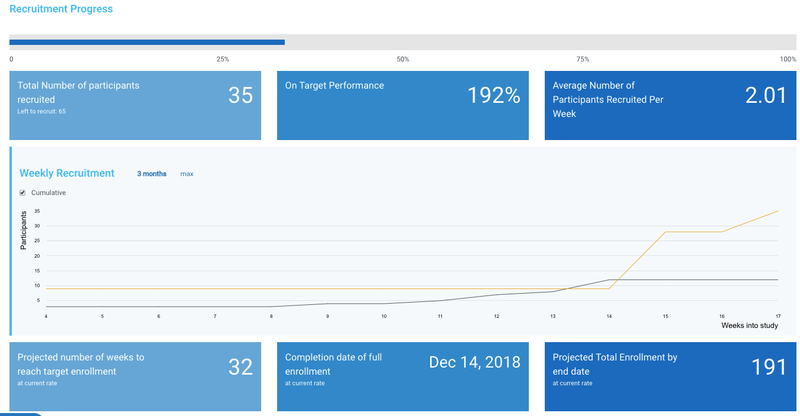 One of the most effective ways to improve your enrollment numbers in to improve the rate of potential to enrolled participant conversion. In many studies and clinical sites, a significant number of potential participants do not enroll for lack of follow up. A proper process will help reduce this loss to follow up and accelerate recruitment. We wrote an article about how to properly track potential participants. 8. Make the outcomes of your campaign predictable by implementing repeatable processes. Recruitment efforts should not a series of individual ideas that are tested and then abandoned. Instead, each strategy needs to be implemented consistently and have repeatable tasks to increase this consistency. For example, this may include reviewing a Facebook campaign analytics and AB tests every 7 days, rotating radio ads at specific time cycles, rotating information tables across 3 pharmacies every week, etc. We also wrote an article that elaborates on these points and presents suggestions on how to make your campaign predictable and repeatable. Hopefully, this article elucidates the ideas behind the CTTI recommendations and leaves you with a better idea how to implement them in your research.